The U.S. Department of Homeland Security ran a test recently to see how easy it could be to trick people into plugging random USB sticks into their computers and potentially infect them with malware. The test showed that the human factor is possibly the weakest link in the computer security: your network may have the best firewall, you can have the strongest policies prohibiting the users from downloading random files from the Internet, yet all that is useless when people have little hesitation in using the USB sticks they find on the company parking lot. 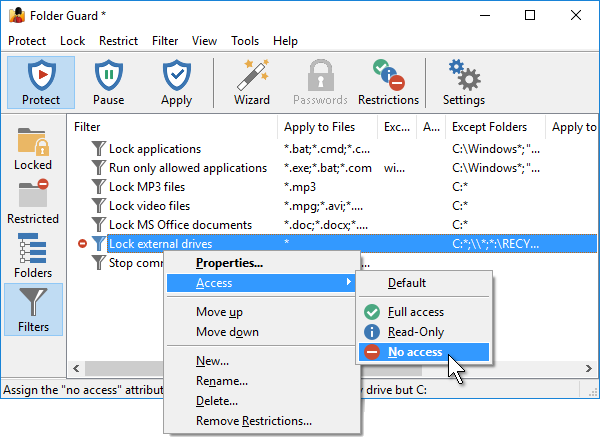 Password-protect and hide personal files and folders with Folder Guard for Windows 10,8,7, and XP. 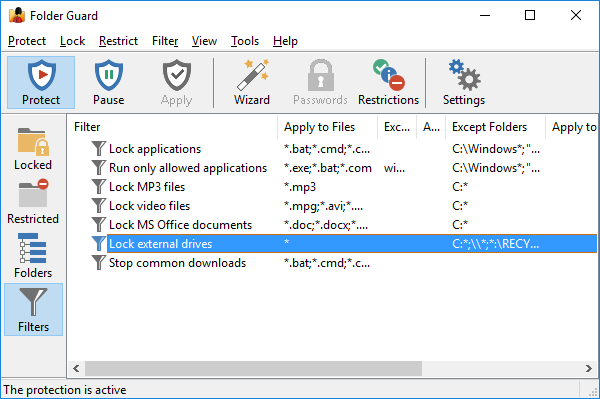 Microsoft has attempted to address such a problem somewhat by disabling the AutoRun feature for the USB sticks in Windows 7. Still, it leaves a rouge program on the USB stick just a few clicks away from running. Wouldn’t it be nice to be able to stop running programs from the USB sticks completely? Part 3. Located on any removable drive. Part 3 of our goal is the trickiest one: how would we specify that the filter should apply to any folder located on a removable drive? We could do it using the drive letters: when someone attaches a drive to a computer, Windows creates a drive letter for it. The problem is, however, that it is difficult if not impossible to predict which letter would be assigned to any specific drive. Usually Windows does it sequentially, but the user can change the drive letter, and what if the user attaches several removable drives at once? We could list all possible drive letters in the Apply to Folders box, but instead of that, it’s easier to specify which drive(s) and folder(s) the filter should NOT apply to. Most computers have a single hard drive, C:, so if we specify that a filter should apply to any drive but C: that would work for our goal. That’s why we used the mask C:* in the Except folders box of our filter: it would exclude any folder that starts with C: from the scope of the filter, just what we want. What about the second mask in the Except folders box, \\* ? It is there to exclude any path that starts with the double-backslash. Such paths are used to specify files on the network, such as \\server\share\. This way, we exclude the network files and folders from the scope of the filter, because we don’t want it to apply to the network files. The final mask of the Except folders box, *:\RECYCLE.BIN, excludes the Recycle Bin folder on any drive from the scope of the filter. 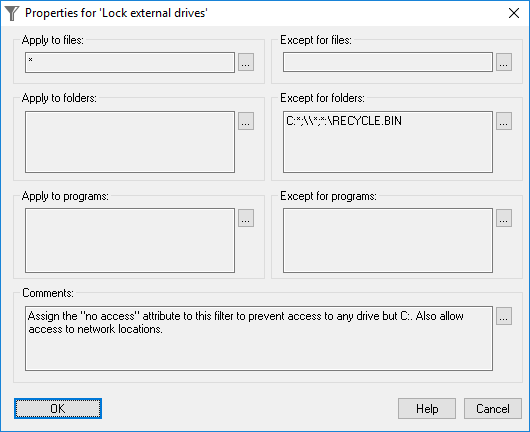 If it were not there, then Windows would not be able to access the Recycle Bin folders on the removable drives, and it would probably make it complain that the Recycle Bin on each removable drive is corrupted. To avoid such problems, we exclude the Recycle bin folder from the scope of the filter, so Windows would have an unrestricted access to it. The rest of the filter properties can be left empty. An empty Apply to box means Apply to all and an empty Except for box means Except for none. We have entered a star character in the Apply to files box, to emphasize that it should apply to all files, but we could have left the box empty, it would produce the same result as the star character. The result of the No access attribute would be that the users would be prevented from both opening the files from the external devices, and saving the files to them. This way, if someone attaches a USB stick to the computer protected with such a filter, he or she would not be able to use the stick at all. Attention System Administrators: Folder Guard is enterprise-ready! The Folder Guard Administrator’s Kit is available now. What if at some point you do need to access a removable drive? Just pause the protection of Folder Guard, perform the task, then resume the protection back (no Windows restart required! ).